The Universal Plantar Faciitis Support provides pressure and continuous support to help reduce the pain caused by Plantar Faciitis. 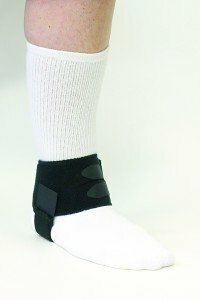 The 1 1/2" elastic strap applies pressure over the medial calcaneal tubercle and plantar fascia. This helps to reduce the pain associated with inflammation due to plantar faciitis, allowing the patient to exercise and maintain proper muscle tone. Support helps provide relief day and night and can be worn with shoes, slippers, sandals - even barefoot. The breathable body wicks away moisture for enhanced comfort. Fits left or right ankle. Anatomically designed to provide continuous support and lift by means of a durable elastic tension strap. Aids in reducing pain and inflammation. Breathable 3/8" foam wicks away moisture. If you have any questions about this product by Corflex, contact us by completing and submitting the form below. If you are looking for a specif part number, please include it with your message.